For the next selection on the highlife turntable, I have selected the track Olabisi Olomi off an Eroya Sounds release by Prince Crossdale Juba. According to an article I found by Afolabi Taiwo, the Late Crossdale Moboluwaji Juba was born in the early 40's into a royal family of Oba Daniel Iksika Juba and Queen Marin Juba in Ilutitun Osooro, Okitipupa. He began his musical career as a Brigade at St. Louis Local Authority School and started out professionally as a trumpeter with the Agundiade Star Dandies, Ado Ekiti before he left for a bigger group Comina Mend and Dynamite Ten, which was a Ghanaian band which played at the Empire Hotel, in Mushin and then later at Club 21 in Apapa. He then played with Adeolu Akinsanya's band and other great highlife musicians like Victor Olaiya, Roy Chicago, Eddy Okonta and Rex Lawson. He ended up doing a number of releases for EMI and Eroya records that documented the vitality of his Modibodo sound. The article goes on to say Crossdale Juba died young, but neglects to give a cause. 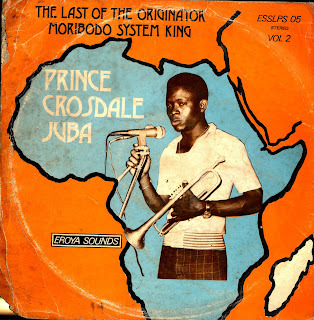 A consummate performer, music critic Benson Idonije said, " the acceptance of Crossdale's Modibodo's music could be measured by the surging crowds that took to the dancing floor each time Juba crept towards the microphone to sing. With a trumpet in hand, he sang with a guttural, glossy voice as he produced modern jazz sounds reminiscent of Mike Falana. His voice can be likened to that of a nightingale, especially with the tinge of Ikale dialect which allows the lyrics tumble out with immediacy and urgency. Juba joined Victor Olaiya's All Stars band and he was able to forge a headway with his Mobibodo Highlife tradition"
I really like this song. Traditional in format, it is tight, brassy and full of life. Check out the drums at the start of the song and the vocals that follow. There are also a number of nice horn solos, including one at the 3 minute mark that just wails. The vocals and the horns come back together for an exuberant finale. Very highly recommended. VERY TALENTED YOUNG MAN VE BEEN LOOKING FOR HIS RECORDINGS SINCE 1982 THX FOR THIS UPLOAD, JUST LIKE WALE GLORIOUS HE DIED SO YOUNG.... IT'S A SHAME FATE WAS CRUEL TO THIS TALENT. The Ikale,Ondo state,Yoruba and Nigeria missed an illustrious philosopher son who made it known to Nigeria state that nothing like farming farming in the 70s today we all know the hiccups Nigeria state is passing through for not bide to his philosophy.